The path to gold for the Canadian women’s soccer team at the first ever World Indigenous Games this fall was not an easy one. 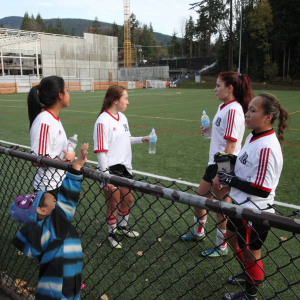 The struggles they had with recruiting, funding, and community support has coaches and players concerned about how to promote competitive sports for First Nations women. They’re also wondering how to make the path easier for the next Games which will be held in Canada in 2017. “If there was some commitments from the government to put funding into the First Nations teams … well, we did get the gold medal, but there is no help,” said Bill Wasden, assistant coach at the Games held in Brazil in October. Sisters Crystal (left) and Justine Laughren both played in the Games. The struggles for the team started at the beginning and never stopped. 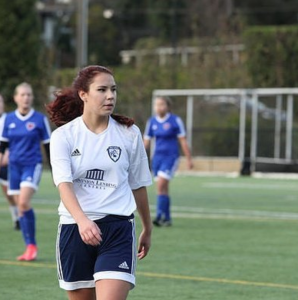 The 23 women, who gathered under the guidance of Vancouver coach Dano Thorne from seven different First Nations, struggled to finance the trip down to Brazil. Some of the players from the Mohawk Nation in Quebec who initially made the team couldn’t afford the flight down. Wasden, who helped recruit and build the team, said the coaches were making changes to the roster up until the last day before leaving. The players came up with creative ideas to raise money. Justine was just 16 when she played in the Games. Justine Laughren, who turned 16 on the trip, held car washes with Squamish teammates until water restrictions put that to an end. She raised the rest of the money by getting a job while also balancing high school, practice, and a social life. The team credits coach Thorne as one of the few who are changing the game for indigenous athletes. He founded the Native Indian Football Association (NIFA) in 1990 in response to the lack of opportunity in high level competition. “There was no opportunity for aboriginal people,” he said. The lack of decent fields, scarce attention from scouting agents, and little funding from sponsors made competition difficult. Funding was not the only hurdle the players faced in training for the Games. Stereotypes abound about indigenous athletes. Team captain Lacey Baker heard slurs regularly at home games. So did the players. 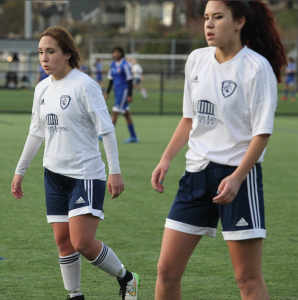 The Laughren sisters (centre) and Lacey Baker (right) of the Squamish Nation play with their recreational league in North Vancouver. Once the team got to Brazil, it didn’t mean the stereotyping ended. Protestors at the gates of the Games verbally harassed the team for being aboriginal. The women said they kept their minds on the game and ignored the shouting. After six games, the Canadian team won the final match against a home team, the Brazilian Xerente. They had won gold for Canada. “Even the coaches, we were all crying,” said Thorne of the celebration on the pitch after the final match. But even that triumph was undercut by the lack of community support back in Canada. The Laughren sisters’ mother, Katherine Letain, says she contacted local TV stations to welcome the winning team back to Canada but received no response.